Buying just a camera is never enough. It is a starting point but it never ends with just the camera. Once someone gets a new camera, they immediately start looking for accessories. Camera bags and memory cards are usually the most popular accessories but depending on how the camera will be used, additional gear will be needed. Camera mounts and clamps are usually required for certain particular activities when the camera needs to be mounted into a fixed position. Camera mounts and clamps are usually made to be used when a tripod is not practical. Places such as boats, trees, roof edges, bicycles, etc. are such examples of places in which a tripod will simply not cut it. Even if all mounts and clamps are built to serve the same purpose, they may have different designs to attach them securely to an object. Typically, they are made out of plastic but some use a combination of metal and plastic parts in order to hold the entire mount more securely to an object. In terms of compatibility, there is no universal mount or clam. Some work with regular DSLR and SLR cameras while others are made to be used with compact action cameras. The way the camera is attached to the mount can be different. Fortunately, there is no shortage in terms of diversity. There is a wide selection of offerings available with all types of camera mounts and clams ranging from just a few dollars and up. It is difficult to rank them in a particular order but we managed to trim the list down to just 10 of the best-selling, most popular models. Without delaying it any further here are the top 10 best camera mounts & clamps in 2019. Which Camera Clamp Or Mount To Pick? When the budget is extremely limited there are not that many options. The Patuo tripod camera clip is an inexpensive option for the ones that need a very basic mount or clamp for their camera. The model works with regular SLR, DSLR and video cameras. It features a 360 swivel ball head and it is very easy to clip onto almost any surface. According to the manufacturers, the camera mount can withstand a maximum load of 5.5 pounds. Anwenk makes a rather decent camera clamp that is both practical and functional. It has a clamp system that makes it easy to attach to most surfaces. 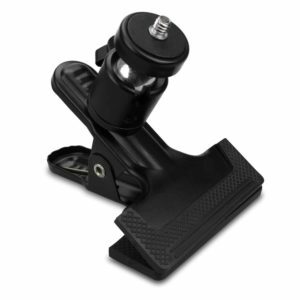 The mount can rotate 360 degrees and has a locking knob. In terms of construction, the camera clamp is made mostly out of plastic. Because of its design, the clamp can be used with a wide range of cameras or tablets. Its clamp system also makes it usable on bikes, motorcycles or any kind of pipes or bars. 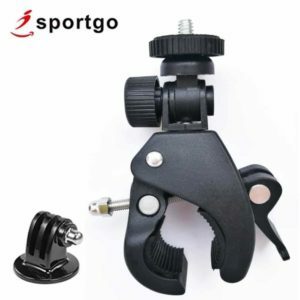 The iSportgo camera clamp mount is a great pick for active individuals. It was designed to be installed on pipes, tubes or something like a bike or motorcycle. It also works with regular cameras but can also support something like a GoPro Hero or a small action camera. The clamp is made mostly out of plastic and rubber with a rotating top. It also allows the angle to be adjusted and it is very easy to mount and lock into place. Another important aspect is the fact that the clamp is very compact and lightweight. 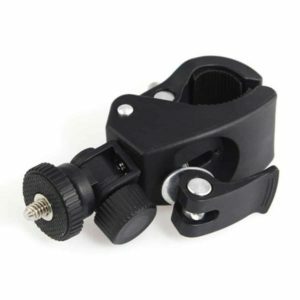 Arkon camera clamp mount is a very practical accessory for regular DSLR and SLR cameras. It has a long goose neck that can be adjusted and it is strong enough to sustain the weight of a camera. It uses an adjustable clamp to help it grip the edge of a flat surface. 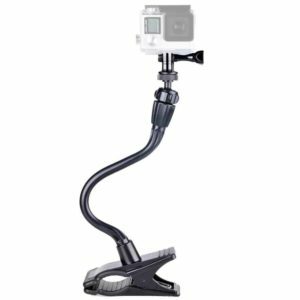 The gooseneck measures about 12 inches and has a swivel ball which makes it easy to adjust the position of the camera. Last but not least the clamp mount comes with a limited 2-year warranty offered by the manufacturer. 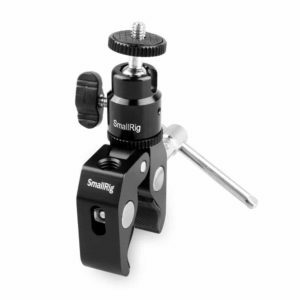 Unlike other clamps the SmallRig has a different design. It is shorter and more compact. This makes it much stronger when it comes to sustaining the weight of a large DSLR camera. It has a mounting screw and an aluminum alloy body. The clamp can work with a wide range of surfaces and has very good grip due to the rubber used on the feet of the clamp. In terms of mobility, the arm can be rotated while the top side has a pivoting head which allows it to swivel completely free in any direction. Using a lot of metal for the body does improve reliability and durability but it can have a downside. The mount can be quite heavy, even as heavy as the camera. The problem becomes quite annoying if the mount is installed on a helmet or an object that needs to be carries. Anwenk ballhead arm mount is a good option for the ones that are looking for something compact, easy to carry and inexpensive. It is a simple mount with an adjustable bottom clamp and a tripod threaded screw. This makes it compatible with the vast majority of DSLR cameras. 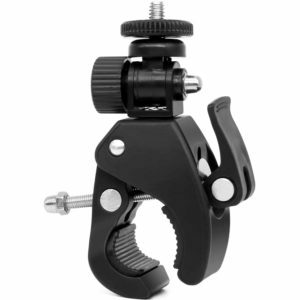 The bottom clamp has a special texture that improves grip and ensures it stays in place. The mount itself is made almost entirely out of aluminum and has a double hall head that makes it easy to adjust the position of the camera. Being made out of aluminum does make it quite heavy. Even if aluminum is a lightweight metal, the mount can feel heavy if it is mounted on something like a helmet. In all other cases, the weight of the mount should not matter at all. 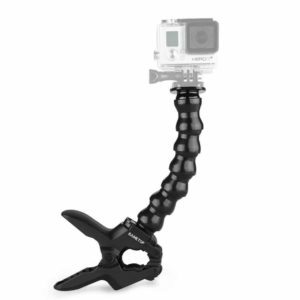 The gooseneck is a great design idea for a tripod or a camera mount. The only problem is how they are built and their quality. Sametop uses a decent gooseneck but it tends to become loose in time. Fortunately the mount can be used without it. CamKix camera mount is yet another popular model that was designed for action cameras. 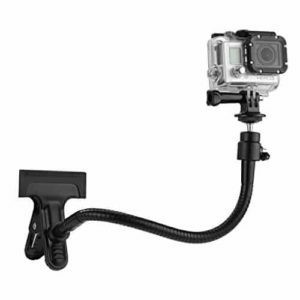 This particular model was made to work with GoPro cameras and other compatible devices. It has a long gooseneck and a ball socket for the top part that makes it easy to adjust. 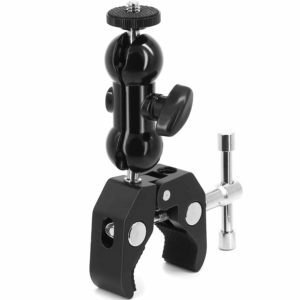 The gooseneck can be removed and the mount can be used without it. In terms of reliability, the mount is made out of plastic and it is fairly lightweight. The clamps at the bottom that are used to secure it in place have a rubber surface to improve grip. The gooseneck is not very reliable but not in the sense that it becomes loose or flimsy. The issue with the gooseneck is that it will not sustain a lot of weight. Heavier cameras will not work with this particular mount. The Supon camera clamp is the cheapest option in our list and it is not as bad as some would expect. It was made mainly for bikes and motorcycles as the clamp is rounded. Inside the clamp a rubber layer has been glued to offer better grip. The camera mounting system is quite standard. It was made to work with most DSLR cameras just by screwing them onto the mount. As for the locking mechanism, it is very easy to adjust and lock into place. The rubber on the clamp is just glued onto the device. Over time, the more the camera clamp is used, the rubber will start to get detached. The only workaround for this issue is just to glue the rubber back which should not be too difficult. Smartree is surely a brand with which most people are already familiar. Their adjustable camera clamp mount is a cheap and effective option. The device was made for action cameras such as the GoPro Hero models. It has a flexible gooseneck that is very easy to adjust and can be extended to 13.4 inches if needed. The clamp has a wide opening and has rubber lines to prevent it from slipping. Last but not least the mount is made out of a durable plastic material which also makes it lightweight. 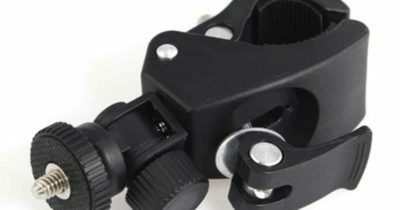 The clamp that grips the mount onto a surface has a small pin that keeps it together. The pin, is not secured in any way. There will be moments in which the pin comes out especially after a few uses since it tends to slide out on its own. It can be inserted back in but the design itself is quite bad. Clamp mechanism: The clamp mechanism is almost identical on all mounts. Most of them work like a regular clip but there are a few that have two flat clamps that can be adjusted and tightened into place. With or without a gooseneck: A gooseneck makes it very easy to adjust the position of the camera. The downside is that they cannot support a lot of weight. Heavy cameras work better with smaller mounts without a gooseneck. Rubber grip: The clamps or the clip mechanism needs to be have a rubber surface that prevents it from slipping. Most of them have a rubber surface or coating while some have just a texture that might not be as secure.